A breve distanza, facilmente raggiungibili e disposte lungo il litorale (foto n° 12) si trovano le spiagge di Tanca Manna (foto n° 13) Barca Brusciata (foto n° 14) le Piscine (foto n° 15). In quindici minuti di macchina si raggiungono le più rinomate spiagge della Costa Smeralda (Spiaggia del Pevero, Spiaggia del Principe, Capriccioli, Liscia Ruja ecc). The little villa, with an astonishing view of the sea and the picturesque coastal village, is located in a quiet residential area just a short walk ( 800 mt ) from the town centre. The house is fully surrounded by a large garden planted with trees, with a lawn and private parking; large terrace overlooking the sea. The village offers all kinds of facilities : bars, restaurants, shops, post office, bank, health centre, chemist’s shop etc. 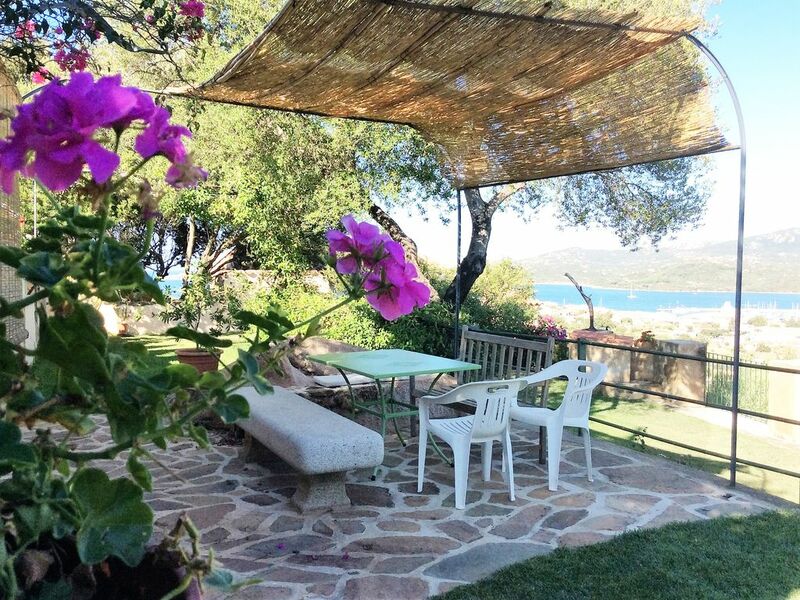 The detached house is an ideal touring base for visitors to Northern Sardinia. The nearest beach is approximately 900 metres from the house; however, few kilometres away, along the coast road to Palau ( picture 12), you can reach beautiful beaches such as Tanca Manna (picture 13), Barca Brusciata (picture 14 ), Le Piscine (picture 15 ). We spent a wonderful week in this house. The owners, Antonella & Tore, gave us a very friendly welcome. They are really nice people and gave us good advice for things to do and places to visit. The house is very clean and comfortable with a beautiful view over the town, the marina and the gulf. It is so nice to sit in the garden and enjoy the view. There are so many places worth seeing in the north-east of Sardinia and Cannigione is within easy reach of all of them. We would recommend this rental to anyone and everyone. I proprietari sono gentilissimi,super ospitali e sempre disponibili in ogni momento per qualsiasi richiesta. Li adoro!!! Se state cercando una vacanza rilassante, questo è il posto giusto per voi!! Davvero consigliatissima!!!! The views of Cannigione is indeed as fantastic as it looks on the pictures. We loved to sit on the patio and enjoy the view. Everything is blooming and smells and is a delight for the senses. The owner couple is very welcoming and helpful. This starts with the communication and goes beyond the well-kept and beautiful garden to the very clean living area. beau jardin spacieux, et belles terrasses ! Séjour très agréable avec un accueil chaleureux et attentionné d'Antonella et de son mari. Tout avait été prévu pour nous et pour nos enfants et nous avons pu profiter de 2 semaines très agréables en Sardaigne. Logement bien équipé, vue à couper le souffle sur la mer, jardin très bien entretenu et très agréable, calme avec proximité immédiate des plages de la Costa Smeralda et du Nord. Tout fut parfait! Encore merci! Absolute Traumlage oberhalb von Cannigione! Ein fantastischer Blick aufs Meer, das gegenüberliegende Gebirge und den Ort. Der sehr gepflegte Garten bietet zu jeder Tageszeit sowohl Sonne als auch Schatten, ganz nach Wunsch. Außer Vogelgezwitscher ist hier nichts zu hören. Der Ort ist in drei Minuten mit dem Auto zu erreichen. Frühstück auf der Terrasse ist ein Traum! Die Gastgeber (Englisch sprechend) sind ausgesprochen nett, zuvorkommend und hilfsbereit. Die Ausstattung des Häuschens ist zweckmäßig; eine große Menge von Geschirr und Küchenutensilien ist vorhanden. Wir würden jederzeit wieder hier wohnen wollen und empfehlen das Häuschen sehr gerne weiter. Dal porto di Cannigione è possibile imbarcarsi su motonavi per visitare il Parco Nazionale dell'arcipelago della Maddalena, inoltre dalla vicina città di Arzachena e possibile fare una gita con il Trenino Verde attraverso uno dei più suggestivi spettacoli da ammirare nel Nord della Sardegna. Le locomotive che partono da Palau per raggiungere la città di Tempio Pausania non sono altro che una riconversione a fini turistici delle vecchie e gloriose locomotrici che iniziavano ad operare in Gallura a partire dal 1888. Cannigione also boasts a pretty boat harbour from which tour-boats leave daily on guided trips to La Maddalena Archipelago, a National Park really interesting from the naturalistic point of view. Furthermore you can get on an old locomotive (the so-called Trenino Verde) and leave from Arzachena on a train journey: most of this route is highly scenic and provides one of the most charming panoramic views of the Sardinian coutryside. Several archaeological sites are nearby: Nuraghe Malchittu, Tombe di Giganti etc.